Niagara University students displayed their purple pennants while participating in papal audience with Pope Francis in St. Peter’s Square on May 23. 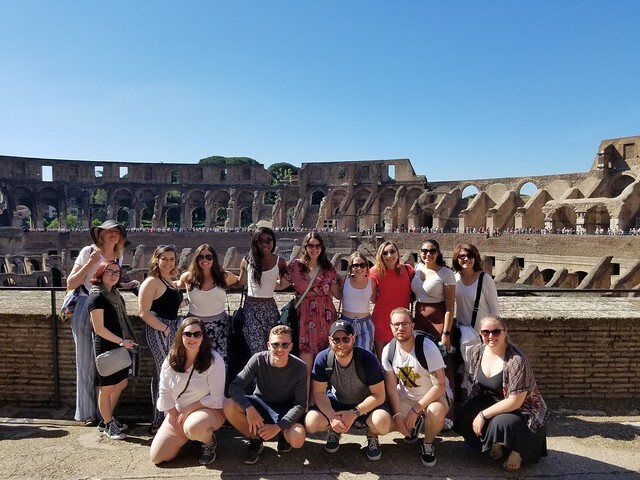 Thirteen Niagara University students spent the last 10 days of May on a pilgrimage through Rome, viewing Roman Catholic art in several prominent locations, including the Vatican. Another major highlight of the program, as expressed by the students, was attendance at the May 23 morning papal audience with Pope Francis in St. Peter’s Square. This year, Niagara University students and faculty – including Marian Granfield, director of art history with museum studies, and Maureen Stevens, associate professor of theatre and fine arts – were among the pilgrim groups in attendance that were announced and welcomed by the pope. The NU students proudly waved their purple pennants upon being recognized by the pontiff. The unique faculty-led study abroad opportunity follows a spring semester course, AHM/REL 340 – Religion and Art: The Art of the Vatican and Rome, which was designed by Granfield and Dr. Amelia Gallagher, associate professor of religious studies. Launched in 2016, this year marks the third time Granfield has taught the course and led students on the trip abroad. Students stay at St. John’s University’s Rome campus, located in the Prati District of Rome, a safe neighborhood with shops and restaurants and within walking distance of the Vatican, metro stops, and major sites. In addition to witnessing some of the greatest art in Christendom, students were also immersed in the Italian culture through an intense itinerary that took them mostly by foot through the neighborhoods of Rome. Students who had step counters were amazed by the fact that they walked, on average, 10 miles a day. Granfield noted that some of the students visited the Trevi Fountain every day. In addition to coursework, each of the students prepared for the trip by writing a paper on a specific site and then presented their research – onsite in Italy – in the form of a tour. Major sites visited included St. Peter’s Basilica, the greatest church in Christendom, where students marveled over Bernini’s famous Baldacchino that marks the spot of Saint Peter’s tomb and the high altar, and Michelangelo’s breathtaking Pieta. Other major and minor basilicas visited included: San Giovanni in Laterano, the cathedral church of Rome and the official seat of the Bishop of Rome, followed by a visit next door to the Pontifical Sanctuary of the Holy Stairs (Scala Sancta). According to Roman Catholic tradition, the Holy Stairs are the steps Jesus Christ climbed on his way to trial during his Passion, brought to Rome by St. Helena in the fourth century. Climbing the Holy Stairs on one’s knees is a devotion of pilgrims and the faithful. This year, the stairs are being restored (last year’s students were able to ascend them on their knees); however, pilgrims visiting the site this year were encouraged to ritually ascend the staircase next to them on their knees as a sign of piety and students who participated were spiritually moved and grateful for this experience. The pilgrimage continued to the largest Marian basilica in Rome, Basilica di Santa Maria Maggiore, where they marveled at the beautiful interior with scintillating mosaics from late antiquity. Smaller basilicas visited included Santa Maria del Popolo with Carracci’s altarpiece, The Assumption of the Virgin, and Caravaggio’s Conversion of Saint Paul and Crucifixion of St. Peter, among other great works; Our Lady of Victory (Santa Maria della Vittoria), home to Bernini’s Ecstasy of Saint Teresa; the Jesuit church of Il Gesu (Chiesa del Gesù), which became the archetype of many Catholic churches during the Baroque period and home to famous ceiling Fresco, The Triumph of the Sacred Name of Jesus, by Gaulli; the Roman Pantheon, “Every god,” later becoming the Catholic church, Santa Maria Rotonda; and San Pietro in Vincoli (St. Peter in Chains), where the chains that bound St. Peter can be found in a reliquary below the altar, and home of the Tomb of Pope Julius II with Michelangelo’s impressive Moses. Other major sites included the Galleria Borghese, the Vatican Museums, Sistine Chapel, Piazza Navonna, and the Christian catacomb, San Callisto, on the Via Appia Antica (old Appian Way Road), the major road of the ancient Roman Empire where St. Peter walked and encountered a vision of Jesus. Finally, a day-trip to Florence to visit the Santa Maria del Fiore (the Florence Cathedral affectionately known as “the Duomo”); the Academia to see Michelangelo’s David; and the Uffizi Gallery. The study abroad opportunity is made possible in part by the generosity of the Borgese family. For more information, please contact Granfield at mgranfield@niagara.edu or visit www.niagara.edu/arthistory.